When the Syrian uprising began in March 2011, no one envisioned mass atrocities on the scale we are witnessing today. No one foresaw the displacement of millions that would dramatically reshape regional demographics. No one imagined that children would become the victims of chemical weapons, or that the Mediterranean Sea would become their graveyard. Today, more than half of the Syrian population has been displaced, a phenomenon almost without precedent in human history. Images of starving civilians trapped in besieged cities have outraged the human conscience. Thousands of children have been slain by barrel bombs, landmines and chlorine gas. More than a quarter million Syrians have perished. These numbers are a shameful indictment on humanity. Each day, in refugee camps across the Middle East, aid workers, seeking neither recognition nor reward, sacrifice their comfort to bring Syrian refugees relief. Entrepreneurs, setting aside the pursuit of profits, lend pro bono assistance to innovatively address refugee needs. Volunteers risk their lives to give Syrian refugees hope and a future. This book tracks the author’s travels to Syrian refugee camps and informal tented settlements in Lebanon, Jordan and Iraq. Relying on his legal background, he offers an unfiltered account of the plight of Syrian refugees from a legal, political and humanitarian perspective. 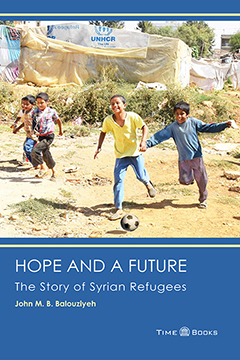 Yet this book is more than just an account of the lives of Syrian refugees; it answers that burning question on so many people’s minds: How can I help? 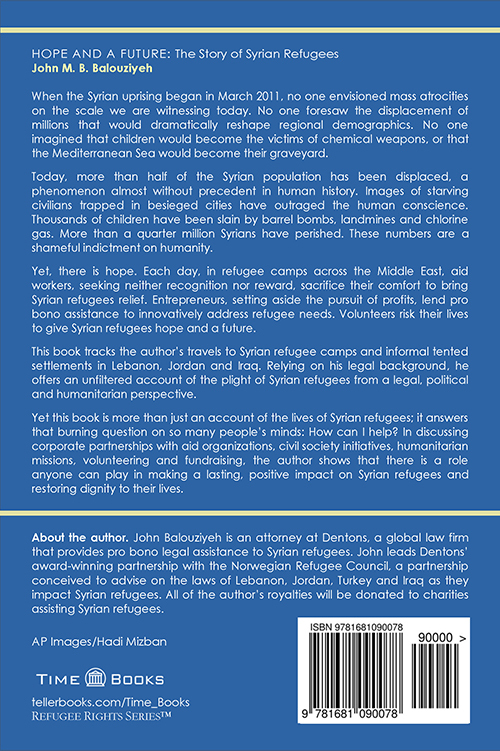 In discussing corporate partnerships with aid organizations, civil society initiatives, humanitarian missions, volunteering and fundraising, the author shows that there is a role anyone can play in making a lasting, positive impact on Syrian refugees and restoring dignity to their lives. John Balouziyeh is an attorney at Dentons, a global law firm that provides pro bono legal assistance to Syrian refugees. John leads Dentons’ partnership with the Norwegian Refugee Council, a partnership conceived to advise on the laws of Lebanon, Jordan, Turkey and Iraq as they impact Syrian refugees. All of the author’s royalties will be donated to charities assisting Syrian refugees.